James Gilland is the marketing coordinator at AdventureLink.com and associate editor of its blog. AdventureLink is a site that helps travelers find and book the world’s best adventure trips. 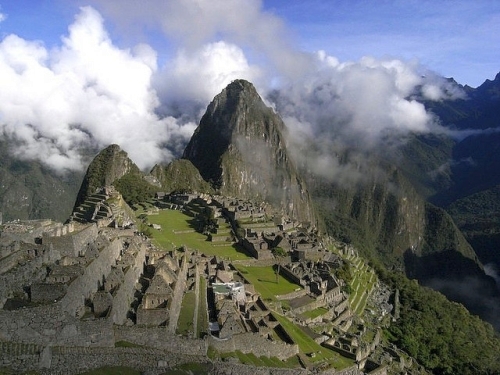 For more information about visiting Machu Picchu, visit AdventureLink’s Machu Picchu tours page. Archaeologists believe that construction on Machu Picchu started around 1450. The site was abandoned only 100 years later due to the pressing forces of the Spanish Conquistadores and the plagues that preceded them. Rather than being one of the greatest cities of the Incan Empire, as modern attitudes towards the site might lead you to believe, Machu Picchu was most likely the estate of the Incan emperor Pachacuti, and considerably smaller than other Incan cities. Ever since its discovery by Hiram Bingham in 1911, Machu Picchu has been the focus of restoration work aimed at returning the site to its original condition. This means that buildings are sprouting up from the ground and walls are growing higher as workers lay more stones atop the originals. So what visitors see today is a re-creation of what Machu Picchu is envisioned to have once looked like. The Incas employed a building method that involved no mortar or any other binding material. They built structures using a method called ashlar, in which the stones are cut to fit so tightly together that mortar is not necessary. This method of masonry is more earthquake-resistant than using mortar, the method currently employed by those “restoring” Machu Picchu. In 2006, a Cusco-based helicopter company called Helicusco was granted permission to fly tourists over Machu Picchu. Fortunately, permission was revoked just over a week later after outcry from environmentalists and archaeologists. Not only would constant helicopter flights in and out of the site harm flora and fauna, but a visit to Machu Picchu would have likely been marred by the sights and sounds of helicopters zooming around all day. Visitors can climb Huayna Picchu, the mountain that serves as the backdrop to Machu Picchu in most photos. 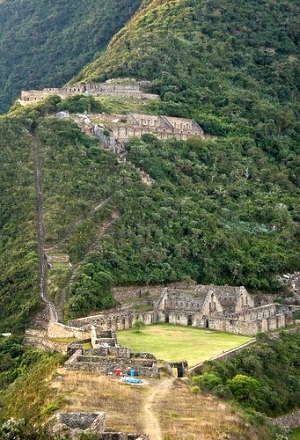 It’s about 1,200 feet higher than Machu Picchu and provides a nearly birds-eye view of the Machu Picchu ruins. The climb is recommended only for visitors in good physical condition. The ascent is steep and steel cables have been installed near the summit to assist in climbing. The number of visitors allowed to climb Huayna Picchu is limited to 400 daily. It takes about an hour and a half to reach the top. For many years the only way to reach Machu Picchu was by foot. Now it’s possible to get very close to the site using modern transport. Visitors can travel to the town of Aguas Calientes, which sits at the foot of the mountain where Machu Picchu is located, and from there take a bus to the site. But many visitors prefer to visit Machu Picchu by foot. The Inca Trail Trek is wildly popular, and for good reason, it is a beautiful path and part of the original Incan road system. But there are other options that potential visitors should consider when planning a trip to Machu Picchu. The Inca Trail Trek is the most popular trek to Machu Picchu. It follows the same road the Inca used to navigate their vast empire. The trek can be done in a variety of ways; most visitors make the trek in two or four days, depending on where you choose to start. Much of the trail is still paved with stones the Inca used. Along the way, trekkers pass other Incan ruins and pass through cloud forests. The trip can be arduous, particularly because of steep inclines at high altitude, but the rewards are plenty. Perhaps the greatest are the views of Machu Picchu as hikers near the site. Trekkers must use a guide and hikers are limited to 500 people starting the trek per day, including guides and porters. Travelers wanting to hike the Classic Ina Trail should book at least four months in advance. The trail is closed in February. The Salkantay Trek is a popular alternative to the Inca Trail. Trekkers are drawn to Salkantay’s less populated route and the fact that packhorses are allowed on the Salkantay trail, lightening visitors’ loads. The trek starts in Mollepata, a four-and-a-half-hour bus ride from Cusco. The trek offers views of the snow-capped peak of Nevado Salkantay, and the possibility of glimpsing the Andean Condor, which has a larger wingspan than any other bird. The Salkantay trek generally takes seven days. On day five hikers meet up with the Inca Trail and follow its route. The Lares Trek through the Lares Valley has grown increasingly popular since limits were placed on the number of hikers on the Inca Trail. Trekkers wandering through the lush Lares Valley encounter small communities that reflect the Andes’ centuries-old way of life. Among the residents are extraordinary weavers and experts recommend bringing a little cash to buy their well-crafted textiles. Note that this trek does not go to Machu Picchu. There are variations of the Lares Trek, but it’s most commonly done in a loop that starts and ends in Lares; participants are then transported to Machu Picchu. This is another trek that has gained popularity in recent years since the Peruvian government placed limits on the Inca Trail. The Choquequirao trek doesn’t visit Machu Picchu but instead leads visitors to the Incan ruins of Choquequirao, a hilltop city similar in design to Machu Picchu. This trek doesn’t visit Machu Picchu but offers amazing natural scenery. It’s a physically demanding circuit that appeals more to serious trekkers than the average visitor. Hikers are rewarded with vistas of the snowcapped massif of Nevado Ausangate, turquoise lakes, roaming llamas and alpacas and other rare wildlife. The route passes through traditional villages and by hot springs where trekkers can stop for a soak. Since the week-long trek is so challenging, requiring many hours of hiking at high altitudes, tour companies often employ packhorses, and participants can even ride horseback. James Gilland is the marketing coordinator at AdventureLink and associate editor of its blog. AdventureLink.com is a site that helps travelers find and book the world’s best adventure trips. You can follow James on Twitter at: @AdventurerJames.